I do not say this often, but I absolutely loved this book. I literally read it in two days, and were stealing minutes from all my other responsibilities just so that I could read about Tris and her adventure. Jessie Atkin really captured my imagination and curiosity as she unfolded this tale about Tris who runs away from home. Tris is running because she does not want to grow up and take responsibility for her actions. But before long on her adventure she is faced with the hard fact that in life responsibility is not something you can escape or run away from. Her new friends in Nowhere help her to realize that there is more to life that just having fun and your way all the time. The world that Jessie Atkin created is unique and refreshing. What I appreciated the most, is that every turn in the story was unpredictable and a new take on everything. For example, instead of having Tris use a sword for defense, she picks a sling shot. This unexpected twists that in the end play an important role in the story, make it refreshingly new twists and turn to the typical preconceived ideas of what should happen. In all honesty, I could not find anything wrong technically or stylistically with this novel. It has been masterfully edited, and I'm a little green with envy. But it is well deserved that the book is such a huge success. It scores a 5 out of 5 for family friendliness. I think that any kid of any age, whether 2 or 92 will enjoy this heart warming coming of age young adult novel. “We Are Savages” by Jessie Atkin is a young adult adventure of a 12 year-old girl who would rather play with her dog and toys than accept the responsibility of growing up. When things come to a head at home, Tris decides to run away with her faithful dog, Mars and mysteriously ‘falls’ into Nowhere, a world where only children exist, getting along surprisingly well with no rules! Along the way, she meets a variety of other children, each with their own place in this ‘society.’ Tris finds more than she bargained for when the responsibility for the lives of the children falls into her hands and they look to her for leadership! Can Tris step up and accept what she needs to do?“We Are Savages” is a fast-paced and fun read is reminiscent of Peter Pan, touching on how difficult it is to ‘grow up’ when staying young forever would be so much easier! I was intrigued by the fact that each child seemed to know their place in ‘Nowhere,’ yet I felt an inner sadness beneath their exteriors. Jessie Atkin has written a beautiful coming of age story told through the eyes and heart of a ‘tween,’ making it completely relatable for younger readers with enough action and fantasy to fuel their minds and pull them into the story alongside Tris, while subtly saying its ‘okay’ to grow up! I look forward to more creative books from this talented author!Reviewed for Readers' Favorite. Within first few sentences, twelve-year old Tris Simon becomes a character to cherish and appreciate. In echoes of Huck Finn heading down river, Tris finds a place that is rich and rough, with few rules and fabulous adventures. Each character she encounters is carefully conceived and quickly developed. She rises to challenge after challenge, both physical and emotional, with her friends and rivals Aya, Logan, Declan and others helping her cope with her predicament. Jessie Atkin offers a compelling first novel, a richly developed coming-of-age story and characters that will stay with the reader for a long time. Echoes of Peter Pan, Bilbo Baggins and even Holden Caulfield ring through this wonderful story. I loved this book! I'd you have ever watched "The Twilight Zone," you'll see similarities of this book and the episode "The Bewitching Pool." I think this is a great book for people ages 8+ about the importance of accepting responsibility and the inability to escape from your past.Well worth the money & I have since recommended it back to my friend who told me about it and forward to two new people. A great first novel! This YA book kept me turning the virtual pages at a speedy pace. I was very drawn to the main character, Tris. The world of Nowhere sucked me in and was believable. The decision that Tris made at the end was the right way for the story to end. Great story.... highly recommend. A well done first novel, with compelling, realistic characters. Adolescent issues of right and wrong, responsibility and identity are integrated into a fantasy setting full of action and adventurousness. A great novel to read as either a YA reader, or as someone who cares about that target audience. We Are Savages is the kind of novel that sparks conversational topics that are intrinsic to the challenges faced by kids everywhere. Loved it! This Peter Pan story is very believable. 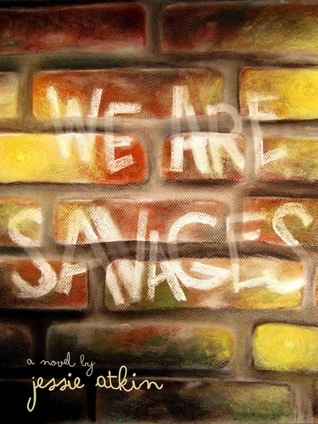 I received a free copy of We Are Savages, courtesy of the author, in exchange for an honest review. And I will be honest: I didn't like We Are Savages very much.To be sure, I have read books that are much, much, much, MUCH worse (*cough cough Fallen *cough cough*). Aside from a few typos, it was well-written. I rather enjoyed the concept of the story; an underground playground that defies the laws of physics? It's the ultimate child's daydream. I can appreciate that aspect. The story is appropriate for kids (which is definitely good, as I'd say the targeted age group is about 7-12). It had a beginning, middle, and end, with good grammar and sentence structure. So what's my problem?I guess I'd have to say my biggest problem is with the loose ends. Maybe I'm missing the whole point of the book: maybe it was supposed to be a brief adventure in the otherwise usual life of a 12-year-old girl, after which she returns home to resume her life, with only the fantastical memories of the magical haven as evidence of it's existence. Maybe. Just maybe these "loose ends" and "plot holes" are irrelevant to the overall goal of story: to entertain the almost forgotten idea of believing in magic.If only my stubborn, pig-headed brain could see it that way.I wish I could have just overlooked these facts and enjoyed the story, but me being my usual self, I had to get hung up on all these questions swirling about in my noggin: How does this underground playland exist? How does one access it? Can adults get there by drilling a hole in the ground? How did everyone else get there? How do they know when to leave? Doesn't anyone suspect dozens of missing children in one area? What are those foggy, mysterious enemies called the Phocydes? Am I taking everything way too literally; is everything in the story just metaphorical for Tris's struggle to come to grips with her controlling parents? Will I ever stop asking stupid questions and get on with my review?My inability to see past these tiny hiccups in the plotline have hindered my enjoyment of the story. I admit it: it's entirely 100% my fault. We Are Savages is a good story for kids to read, and if you're not like me, you'd probably enjoy it yourself.I wrote a really bad review for We Are Savages the night that I finished the book, and because I was so tired and cranky...well, it shows through in my original review. Feel free to read it on the blog I co-write for, BooksBooks&MoreBooks, but please keep in mind that the views expressed here are much more accurate to my actual opinion of the book. This book would be something to consider for younger teens, even older middle grade readers. Even though our main character Tris goes on an adventure, it's a plot geared solely towards the learning of a lesson and that knowledge coming full circle through the adventure.A lot of the characters and the world building is not fleshed out. The relationship that Tris has with her parents felt a little off to me. And leads to thoughts that maybe the Phocydes are an interpretation of that relationship.Younger readers will not be as critical to these things, but I feel that teens for sure may find a lot of these little faults unsatisfactory. The only real dilemma though with younger readers is the length of the book. At 296 pages and the age group it's appropriate for that they may not be able to stick with it to the end. It was not fast paced and has spots of action that push the story forward, but not as constant as I would have expected.I feel that I would have enjoyed the story more if the main character was older 14 at the youngest. And maybe the side characters parents, other children, the world of Nowhere and the Phocydes were rounded out more, all the pieces would have fit together better.As is, this book would be suited for discussion topics. Maybe libraries or classroom discussions could get going. Topics like character growth especially interactions with each other and the addition of fear and learning from your mistakes.I give this story 3 stars for the interesting plot line and Declan and Tris. My favorite characters. Although many of the characters were developed well, and the book was very unique, I couldn't relate to it at all. I didn't like the lesson it taught that when you find yourself in a difficult position it's ok to just run away and hide instead of learning how to deal with your problems or learning how to overcome obstacles in your life. It basically taught that you don't need to grow up, you just run away to Nowhere and forget all your loved ones and problems by playing games. I didn't feel that Tris learned anything or grew as a character. There isn't any language or "intimacy." There is some violence as they fight the phocydes, but it isn't excessive. I would say it would be appropriate for the YA crowd. I don't think it's appropriate for middle graders because of the message it sends. You may read my full review on my book blog: www.the-readathon.blogspot.com. This definitely a young adult novel, even you get than a typical young adult novel but I loved this story. It is not complex but it is beautiful. This is a perfect Peter Pan-type story for 6 to 10 year olds. Much older than that, and I think boredom would set in. Jessie Atkin - Jessie Atkin lives in Upstate, NY, and attended Washington University in St. Louis. She received a B.A. in English Literature. Besides reading, she was also involved in theater during college, working as an assistant stage manager and even trying her hand at acting in a single show.Jessie learned to read later than most, but her sudden ability coincided with the release of the first Harry Potter book in 1998, and an obsession was born. Aside from Harry Potter, she also learned to love comic books, with a particular affinity for superheroes. Other than young adult fiction, Jessie also writes plays in her free time. We Are Savages is her debut novel.